In some ways this is the prototypical British thriller from the early war years - before the firebombing began in earnest, before the V-2, before the extent of the Holocaust was known; in other words, it was made in the days when the war could still be safely imagined as a rather sporting adventure, a challenge to British manliness and fortitude, and a spirited game that could be halted each afternoon around four o'clock. Yes, it was a matter of life and death, but a sharp wit could still get you through. This thriller's shades of gray are rather light compared to those of the far more acidic post-war classic made a decade later by the same director: The Third Man. Unlike that film, Night Train to Munich's "version" of World War II serves more as an alarming backdrop than a visceral challenge to the fundamental morality of humankind. This movie's more comedic approach generally succeeds thanks to a good cast, even while the plot is pure Swiss cheese. Night Train to Munich already shares much with Hitchcock's The Lady Vanishes - three cast members, screenwriters Frank Launder and Sidney Gilliat, a plot revolving around international intrigue, and an extended sequence set aboard a train - so it's kind of surprising when Night Train's opening shot also mimicks that of The Lady Vanishes: a slow zoom on a miniature building. In this case, the building is The Berhof, Hitler's mountain retreat, and inside, the Fuhrer is yelling and screaming about Austria and the Sudetenland. It's a great lead-in to a quick montage of Nazi movements throughout the late '30s, as they grab bits and pieces of Europe and expand the Reich. Meanwhile, in Prague, Dr. Bomasch (James Harcourt) must escape before the encroaching Nazis kidnap him and his new formula for armor plating. Bomasch makes it out, but his daughter Anna (Margaret Lockwood) winds up in a concentration camp. With the help of Czech dissident Karl Marsen (Paul Henreid), she escapes to England and finds her father. No sooner are they reunited than Marsen is revealed as a Gestapo spy, and he and his German cohorts spirit the Bomaschs back to Germany. From here on out, it is up to English agent Dickie Randall (Rex Harrison), who follows them to Berlin, posing as a high-ranking Nazi engineer. Randall devises an elaborate ruse to contact the Bomaschs and bring them back to England; when Marsen unveils Randall's true identity, the entire mission faces the greatest peril. For a 95-minute film, that's a lot of plot. And I didn't even mention Charters and Caldicott, the cricket-obsessed travelers from The Lady Vanishes (and their own subsequent series of films), who show up here as sort of British deus ex machinae and play a major part in saving the day. It's all very swift, with clever dialogue by Launder and Gilliat, and economical direction by Reed. Ultimately, it just doesn't add up to much. The story is too predictable, and the characters are all stock figures, with the exception of Randall, to whom Rex Harrison lends a full measure of debonair wit. As comic relief, Charters and Caldicott are handicapped by not being allowed to be as dense and oblivious as they were in The Lady Vanishes. Their presence here feels like a narrative crutch that puts a drag on the momentum while serving as an easy "out" for the tight spot Randall finds himself in. Besides which, these two very English Englishmen never explain their presence behind enemy lines - and don't express much concern about the matter, either. 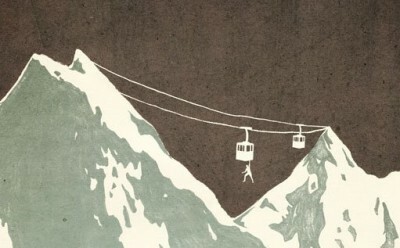 The film concludes with a well-staged action sequence involving gondola lifts that stretch between Germany and Switzerland; it looks like the precursor of a similarly-staged scene in On Her Majesty's Secret Service. Here, as in the film as a whole, Carol Reed can be seen growing into a master of atmosphere, ably commanding the look of the film from a design and photographic standpoint, all while serving the script and curtailing directorial flourishes. Criterion delivers a very solid full-screen black and white image. The picture quality is remarkable, although this relatively little-seen film may have benefitted in the preservation department by not having been widely circulated. Contrast is excellent, with an appropriate level of sharpness bringing the shadowy compositions to life. The mono track is likewise in excellent condition. There are a few instances where dialogue is muffled by an actor being just out of boom range. The quality of the soundtrack, however, is crystal clear and vibrant. As the film is a somewhat marginal entry in The Criterion Collection, the label has only included a single bonus feature: a conversation between film historians Bruce Babington and Peter Evans, in which they discuss the film's production and its significance in the career of Carol Reed. It's an interesting if dry piece. Beyond that, the typically outstanding cover art by Eric Skillman is a major selling point. Night Train to Munich features some excellent photography and several creative uses of miniature sets. On balance, the film is reasonably diverting if not particularly memorable. It's well worth renting, but not worth purchasing, particularly at Criterion prices. Rent it.